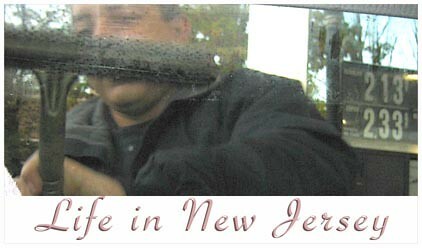 Life in New Jersey, originally uploaded by modeknit. I traveled up to The Yarn Barn in CT today for a very nice class of very nice (and accomplished!) women. We worked on swatches for the Cocoon Shrug and everyone did beautifully! I don’t think there are many drives nicer than the Merritt Parkway on a late October morning. It was stunning today – sunny, golden, just a beautiful day. This time of year makes me feel so alive and introspective. On the way home I got to listen to a wonderful Selected Shorts (I miss this most Sundays) and thoroughly enjoyed the drive. Attending a Selected Shorts program was one of my first dates with Gerry. 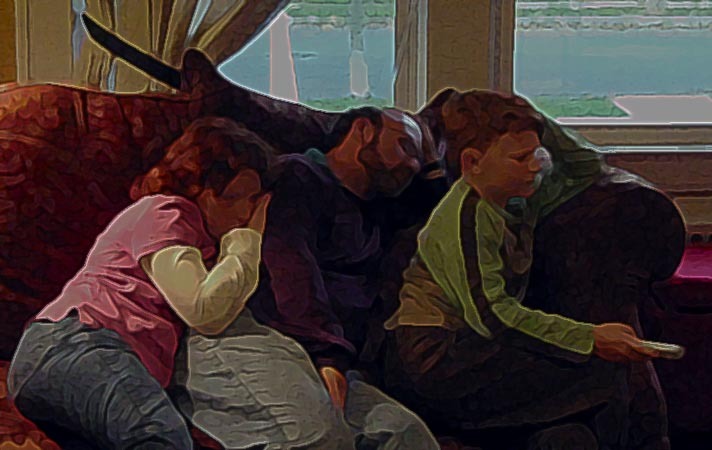 And the bonus was that when I arrived home the family was on the sofa, watching a movie and waiting for me. Unfortunately Maxie seems to have caught a cold, which Gerry is sharing. Hannah and I are the healthy ones, and Gerry’s off to bed (early for a change!) with some AirBorne. Still my favorite NYC shop. Of course, I’m very biased as it’s the only shop that’s invited me repeatedly for classes, but I love Helane and her staff – just great folks! The customers always seem pretty happy, and during the class there was a fellow having a private lesson with Helane. FAB to see that. I also got to meet – in person – Marni Sussman who knit up one of the lovely scarves for Romantic Hand Knits. I had a little slide show of the pieces for the book that I showed at the end of the class, and Marni and I were both practically sobbing when her scarf glided across the page. I’m telling you, I cry at coffee ads! Huge thanks to the folks at TP for having me again, and for putting up with a class in the middle of a busy day! I’m working up further swatches for a double knitting class and a modular knitting class, enjoying the clean house and the fact that in the past 3 days we’ve had six families through here. It’s so odd the comments the real estate agents make. One told us that we should change the room I keep my yarn in into a breafast room. Now, of course that’s what it was before we moved into the house, but it makes me laugh to think that they assume that no one is living here, working here, and where would I put the yarn?? Oy. So now you know my breaking point – I’ll paint the house, rip the carpet off the stairs with my bare hands, but DO NOT MAKE ME MOVE MY YARN! We wait in the house. No further word on Mr. & Mrs. Can-You-Be-Out-In-3-Weeks, maybe they found a nice, empty house?